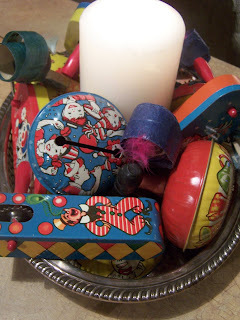 We decided to invite friends over for tonight at the last minute so I didn't finish give away projects, but one item will be three of these vintage noisemakers (for next year Ü). Aren't the graphics wonderful? I will show other give away items tomorrow! I hope you all have had a great week. 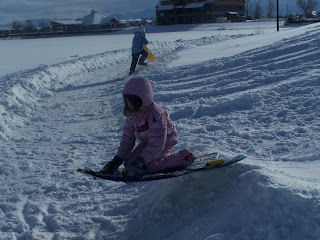 We've been busy with family--Eating, swimming, eating, sledding, eating, laughing, eating. We got 8 inches of snow Christmas night--that added to what we had. It's been fun, but now I need a vacation. My dear friend that I painted baby furniture for had her baby girl today. She is not named yet. Mom pushed for 4 hours. Little sweetheart was turned upward and her nose was getting stuck. She is beautiful! And here it is my 100th post--wow! Didn't know if I'd make it this far when I started. Your kind words and encouragement have kept me going and have brightened many days. I thank God for my bloggin' friends--you are all so kind. I will show you tomorrow what I am giving away, because I am still collecting and creating for it. But leave a message here on this post to be entered to win. I will draw a winner on Friday evening at 6:oo MST. Good luck and love U! I wanted to take a minute and wish all of you a very Merry Christmas. May the celebration of the birth of our Savior bless you and change you. 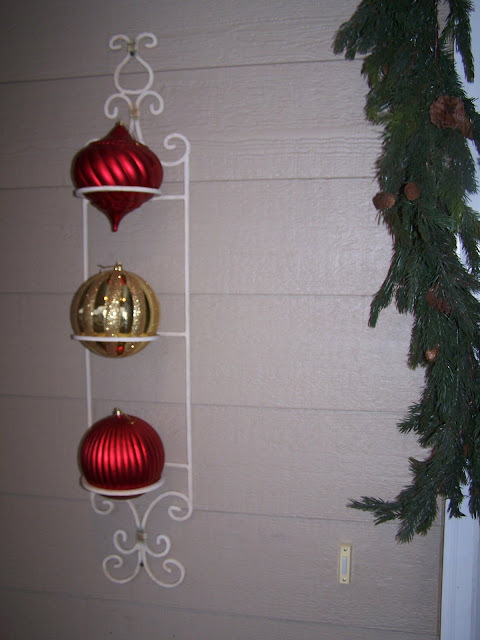 I also wanted to show a few last cheap decorating ideas I did. Plates are from a garage sale. 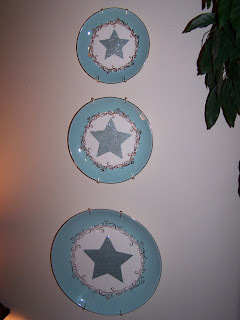 I cut out stars using from tacky tape on my cricut and added some Martha glitter. I wanted this saying above my nativity. 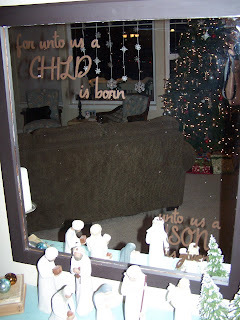 Originally I was going to just put it on the wall, but didn't want to have to redo it every year so I found a $5 mirror at the thrift store, painted it brown and added the vinyl letters cut on my cricut. Shake well and use over a salad made with mixed greens, pecans, raspberries, parmesan cheese. Oops, I told you I was going to post tomorrow, that was Tuesday night. I know you sweet readers all understand! 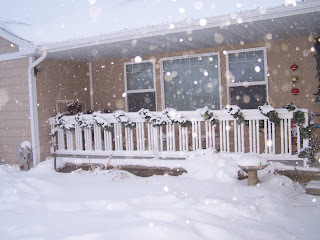 We've had more snow and it the high is negative 10 today--at least we will have snow for Christmas, which I love. My daughter helped with with the jewelry. Anyone know how to straighten that leather cording out? My son made the duct tape wallets. We made what we call a bed buddy. 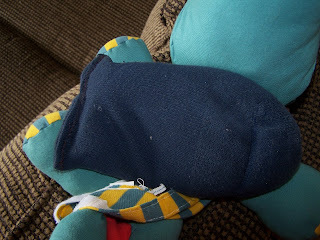 We took the stuffing out of a purchased stuffed animal and sewed the legs and neck closed so that stuffing wouldn't come out. We added velcro and a rice bag sock. We also made this pillow and made a rice bag out of muslin to tuck inside. A warm rice bag goes a long way on a cold Montana night! I made this throw for my sister. 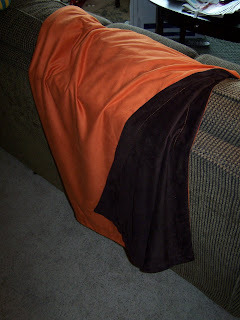 She just changed her family room colors to burnt orange and blues and browns. This is made out of micro suede and is so soft. The fabric was 70% off at JoAnn's. I didn't put any batting in it. 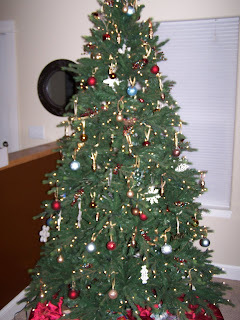 Here is the tree (no--you haven't had too much eggnog--the picture is a little fuzzy) and a nativity cross. 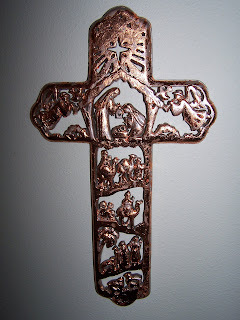 It was silver, but I wanted it copper so I spray painted it and used copper leafing on it. Hope you all are enjoying the last few days before Christmas. I am almost to 100 posts I think--I will have to have a giveaway. I will let you know and I still have a few decorating things to show you. Stay warm! December has not been a good posting month for me--so busy. I am behind on Christmas "stuff", but not stressing it too much. We had our preschool Christmas program last night. They were adorable and there is nothing like the telling of Jesus' birth from the mouth of babes. We got slammed with some arctic cold. It's been 20 below every day since Saturday. It blizzard Saturday, we got 6 inches of snow. Does school get canceled here in Montana when it is 20 below (22 this morning!)? Nope! The warmest it is supposed to be this week is 16 degrees! 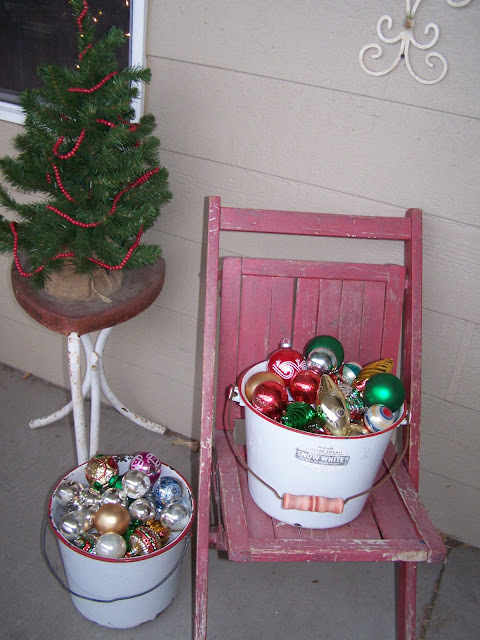 Here is my bucket of Christmas balls now. Mind you this is way up on my covered porch, next to my door, that never sees moisture. That is how hard the wind was blowing. Remember my little wooden bowl I redid? Now it is filled for Christmas. 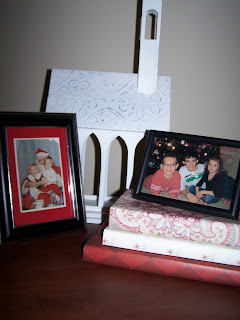 This little niche holds gifts made or given to me by my children. 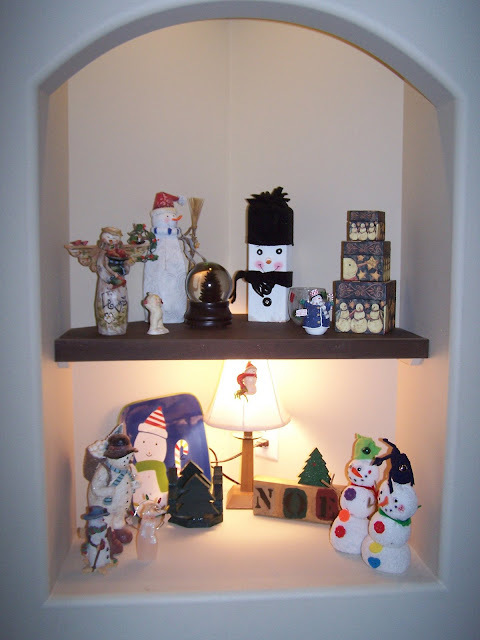 It is a little plain and needs some more height--but he kids enjoy looking and remembering each item. I have more to show you tomorrow, but I am tired and eldest son needs the computer for homework. Tomorrow is the last day of preschool before vacation--jammie day-yea! As mentioned in past posts my dear friend is about to have her first baby, after trying for 3 years. I gave her this changing table. It is a piece I have had for about five years--I bought it for $15 at a garage sale. I forgot before pictures--I know, big surprise. 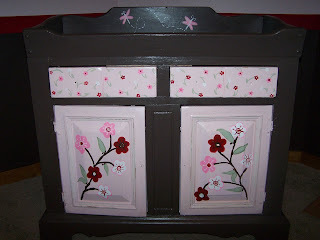 But it was ugly brownish, purplish and had neon rub-on flower decals on the doors and drawers. I painted it to match her crib set. The bright pink looks a little neon in these pictures, but it isn't. The doors are a little open and there is no hardware on it yet--she ordered some pink glass knobs. 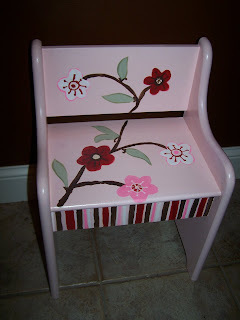 I also painted this little bench she had found at a garage sale this summer. It all looks cute in the baby room. And now I can focus again on Christmas. Just a quick note to say, hello, I am still her, although I haven't been here in the blog world too much. I hope to post some pictures tonight and tomorrow at the very latest. I have been busy painting baby furniture. Tis the season to be busy, falalalalala. 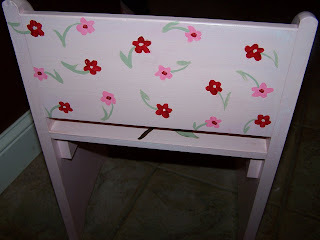 Except tisn't the season for painting baby furniture, but I needed to get it done, as it's been hanging over my head. the top (which is what I do in the summer too). This one is pretty simple, like me (I think my DH would disagree with that statement Ü). I am an abstract random girl, so I used all kinds of colors. 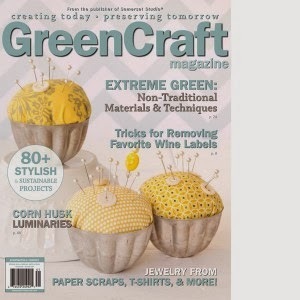 You could do all green to make it look more tree like or just two colors like green and gold. You could wrap lights on them too. 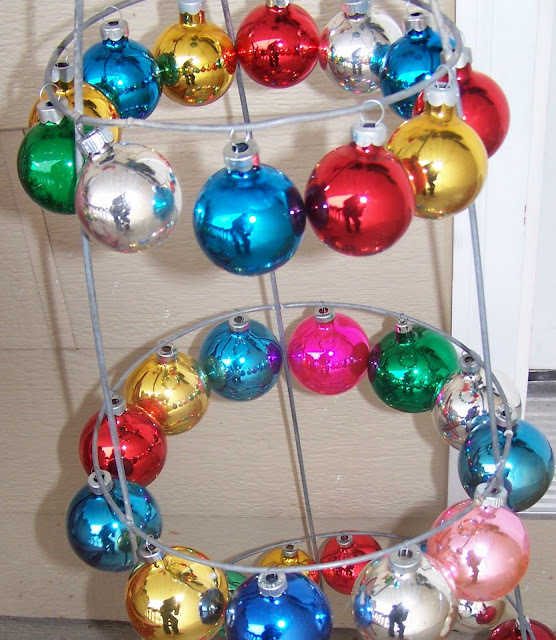 I do have some tomato cages, without the glass balls, wrapped in lights. I will try to take pictures of those at dusk--they are much prettier with the lights on. You could use a star or actual tree topper on the top. 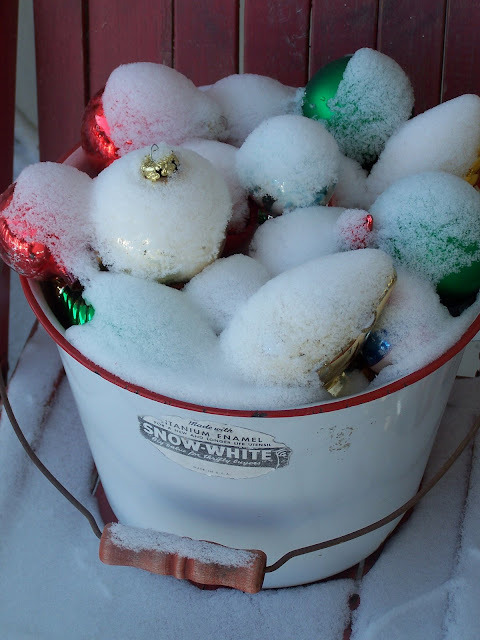 You could other ornaments from it, not just balls. 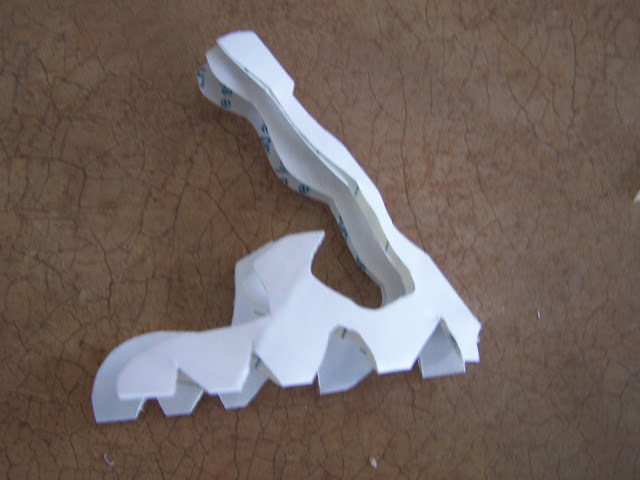 Let me know if you try this easy peasy project. 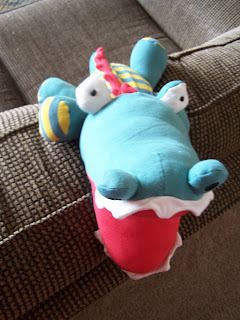 My six year old daughter is making one now for her bedroom. Art? Not sure if this really qualifies as art, but it works for me. I wanted, no needed 😏, something to hang on my fireplace for Christmas. As mentioned before, since changing my living room colors to blue, I have had quite the challenge deciding what to do for Christmas decorating. I decided to incorporate the blue, keep the deep reds, and get rid of the silver and bright reds. So, I wanted something that had blue, but also deep reds. However, I am trying to do this on a strict pretty much zero budget, so I had to use what I had. I have had this canvas for at least three years. I then put them on the canvas. Now they did not stick like I had hoped. 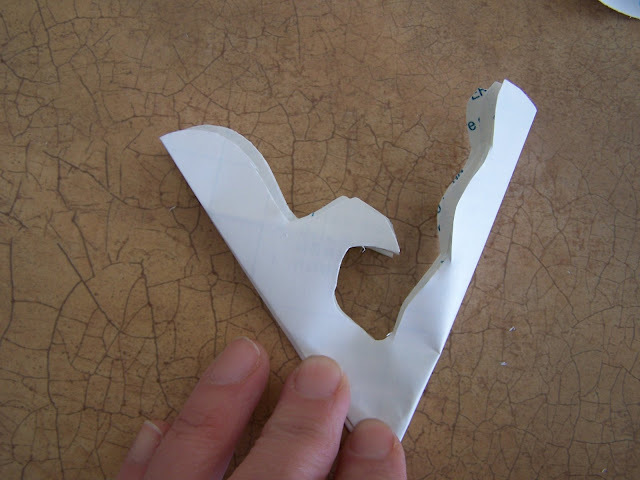 The contact paper was a little old so that may have been the problem. I decided to seal the edges with white paint--gel medium works well for this, but I didn't have any. 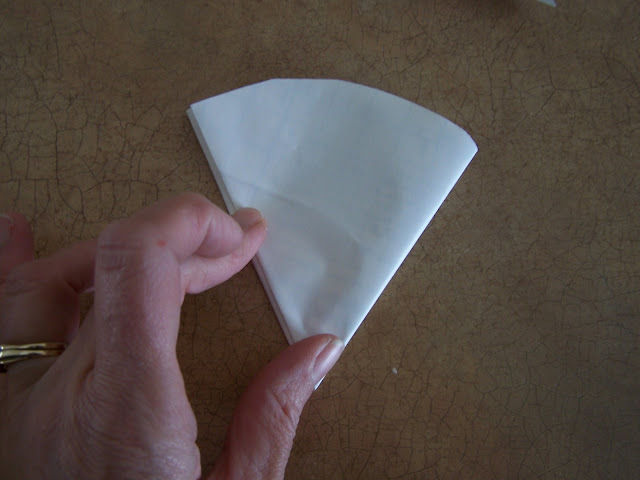 I wanted to use freezer paper and iron it on, but I didn't have any of that either. Sorry, I forgot to take pictures of the next steps--kids came home from school--life got crazy. But, after the white paint had dried, I painted a mix of two blue colors and some white with a big brush over the entire canvas. When that was dry, I added the red swirls. 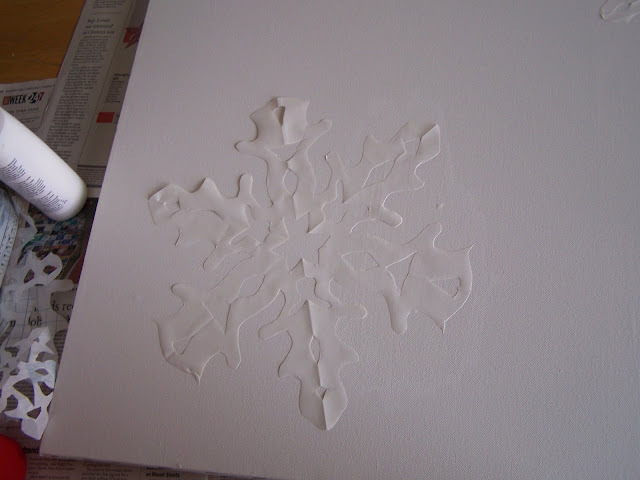 I then took off the snowflakes--there was a little leakage, not much, so I touched that up. It still needed something so I added the watered down white swirls. 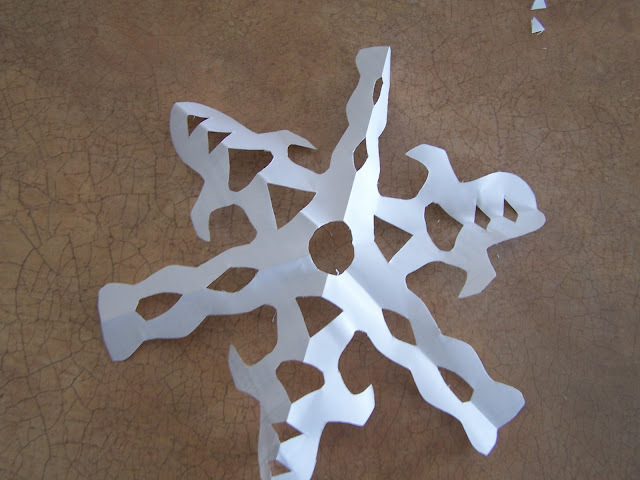 It may get a little clear glitter on the snowflakes too. 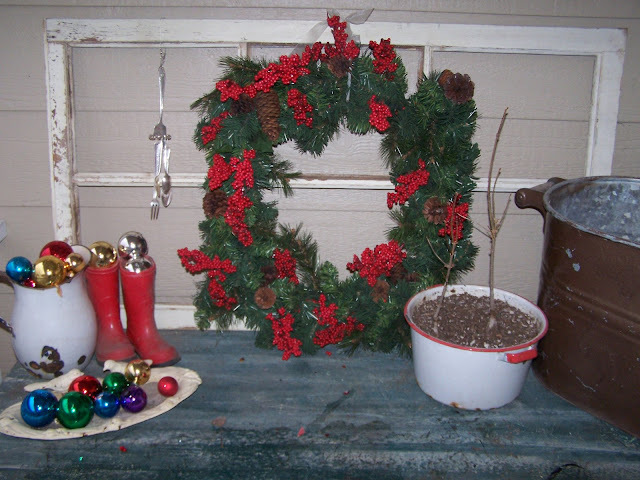 I got my outside decorating done yesterday. The boys put the outside lights up. 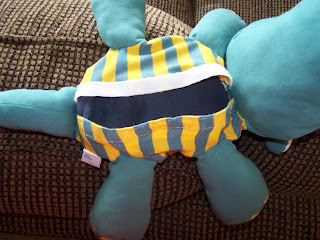 I need new ones, but will wait until after Christmas, to get them on sale. 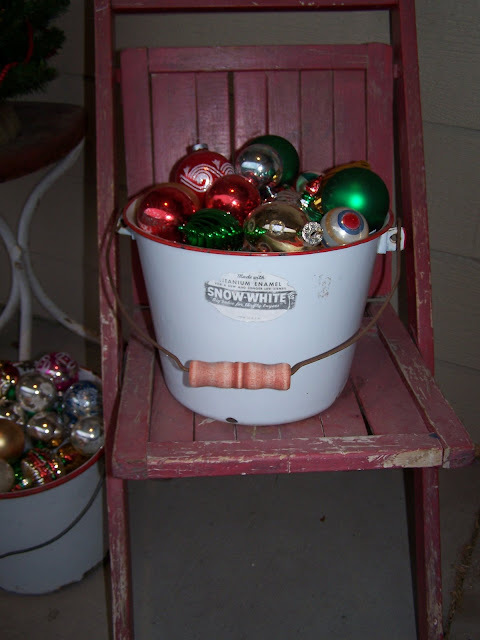 I use my old enamel buckets for some of my decorating and lots of thrift store Christmas balls. 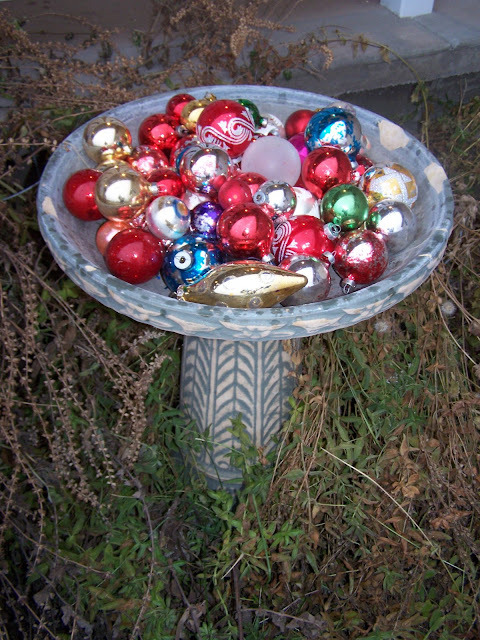 I put them in my birdbath. Oops, never got my perennials cut down, oh well. Half the time I do it in the fall, and half the time in the spring. Wish they were covered in snow. 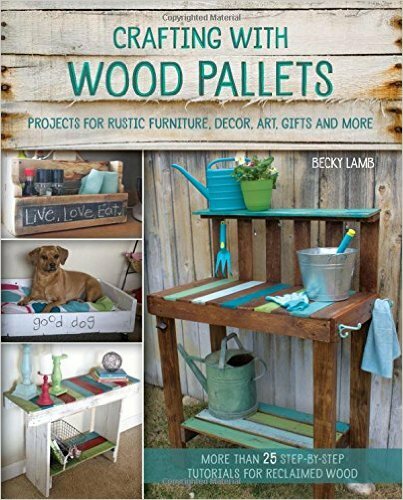 I use them here on my potting bench in rubber boots and in a bird feeder (don't worry, I am not starving the birds--I never put birdseed in this one--I end up with too much poop on the porch!). 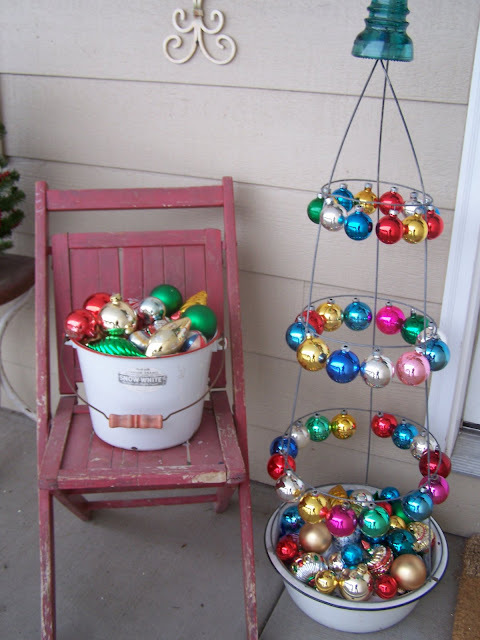 I have these giant Christmas ornaments in my plant holder. 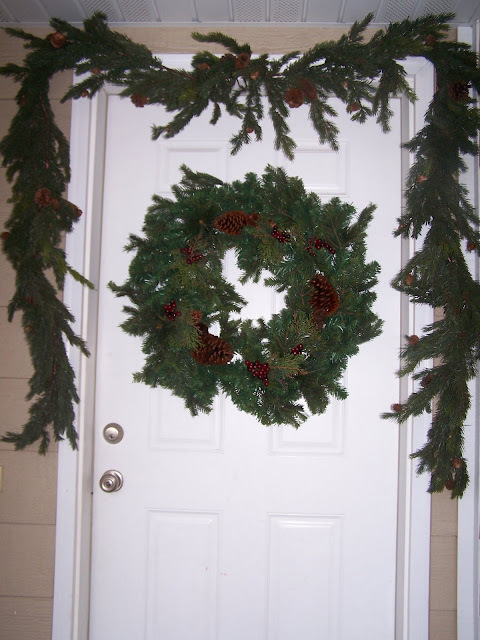 Here is a little plastic greenery on my front door. I used to use fresh, but got tired of cleaning the needles from my entry way. I bought good stuff, it fools even me sometimes. 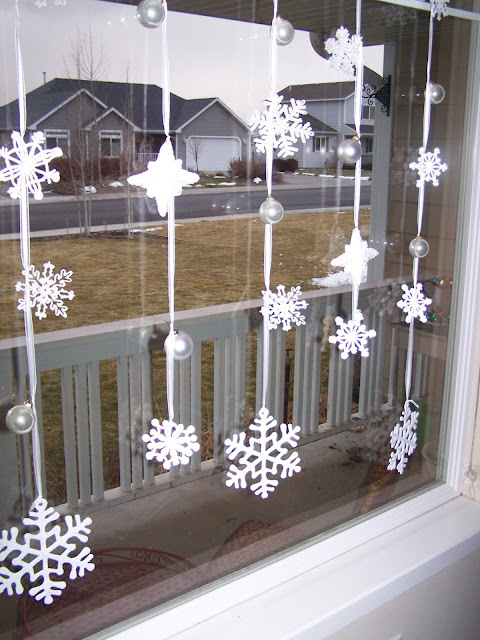 And here are some snowflakes and balls in the front window. 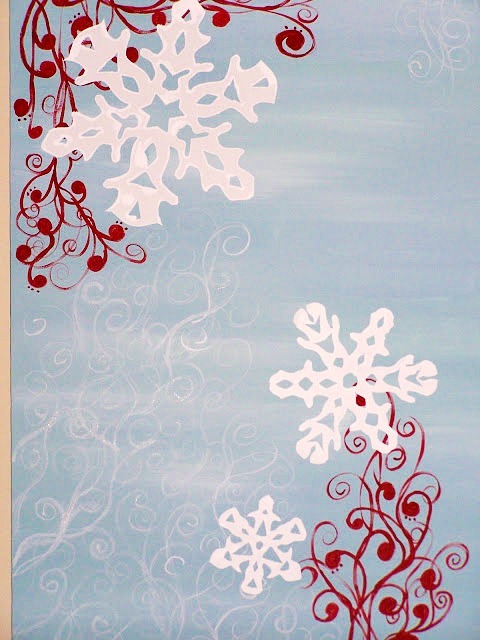 The 3 largest ones were red, but since I changed my color scheme this year, I spray painted them white and added glitter. I changed out some of the red balls with white ones. On another note, please check out this link and watch the video. http://www.adventconspiracy.org/ It is sad how we have changed Christmas and commercialized it so much and the money spent is outrageous! Or should I say, bowl done over. Back to Thanksgiving decoarting for a moment. 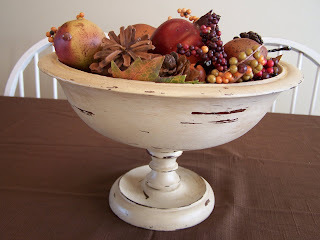 Here is a wooden pedestal bowl that I bought for $2. It was your basic wooden bowl, not too great (I forgot to take a before picture). 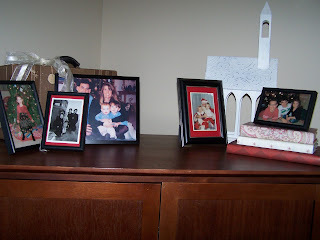 But with a coat of cream paint, some sanding and stain, it was transformed. I got some fake harvest goodies (at 70% off!) to put in it. It will probably stay for Christmas with glass balls in it or glittered pinecones that I am working on-I haven't decided. I didn't get to more Christmas decorating yet--too crazy with kids. Hopefully tomorrow after preschool. Well, not too much yet, but a little. I woke up to three inches of fresh snow today, which inspired me to clean and to start digging through the Christmas boxes. 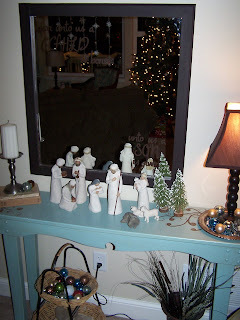 The Inspired Room is having a holiday link party so I thought I'd share one of my favorite Christmas decorating ideas. 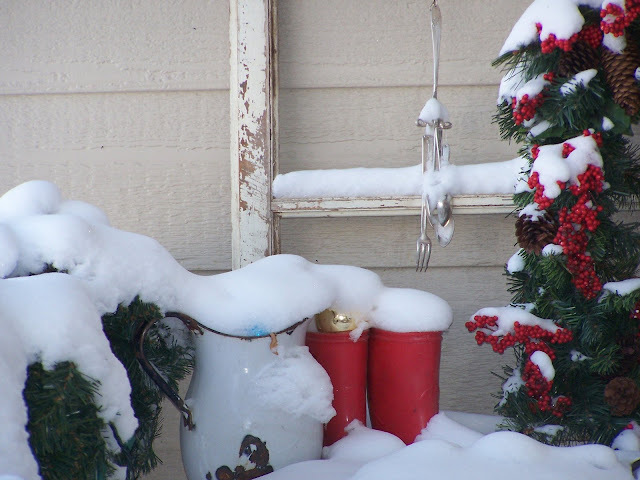 I will be doing more Christmas decorating this weekend so that when I return from Thanksgiving, it will be done. One of the first things I pulled out was these pictures that I use every year. I am missing a few, must be in another box because it would have made too much sense to put them all together in the same box. 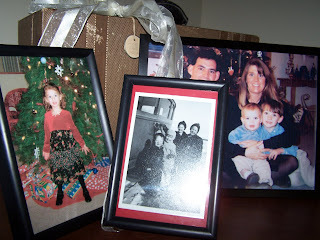 These are photos of past Christmases. Some of my kids, some older photos of me. I am the sweet child in blonde curls screaming on Santa's lap. The little boy in the oldest picture in the snowby the car is my father-in-law. The frames are from the dollar store. 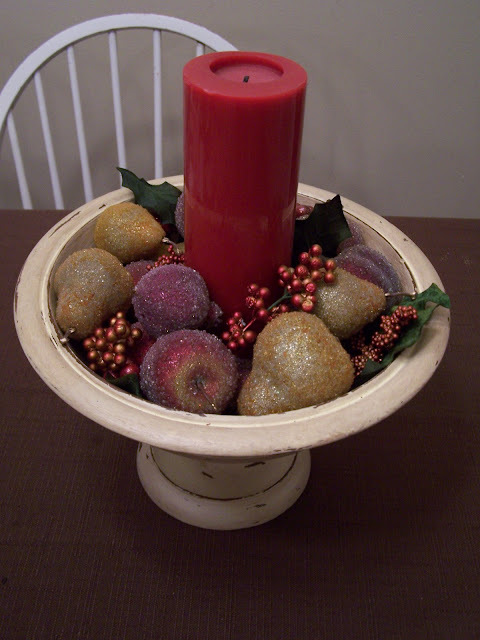 I still need to put some greenery in the church--I like to use fresh, so I won't get that for a week or so. I wanted the pictures at different heights, so I covered some books in scrapbook paper. 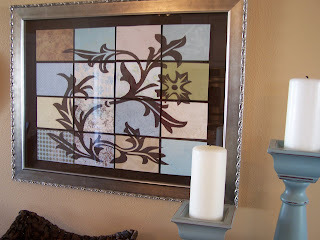 I had to tape two pieces together, but it is a great way to add a little color. I am not sure if I will keep these particular papers. Now that I have changed the color scheme of my loving (ok loving was a typo, but I decided to keep it Ü) room, I am trying to incorporate blue into my Christmas decorating, all on a small or non-existent budget. 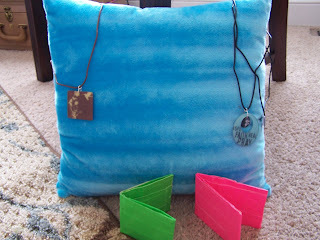 Jen at Sanctuary Arts is having a link party too with things made with scrapbook paper. 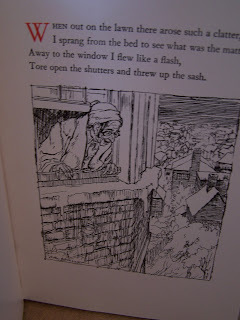 I thought I'd include this, since I covered the books with it. 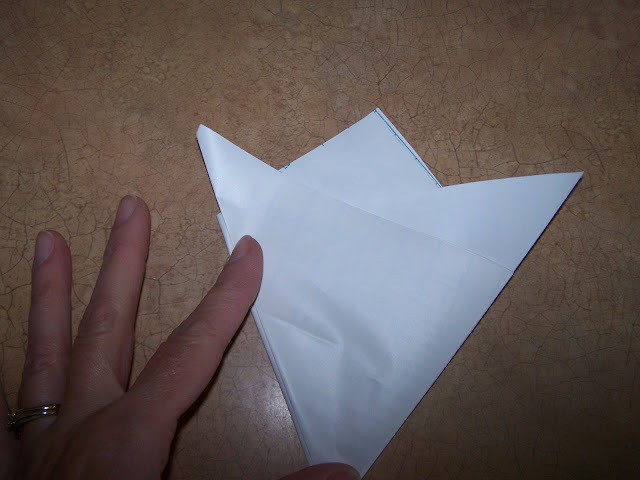 Plus my previous three posts were all made with scrapbook paper. I also wanted to share one of my favorite thrift store finds from a few year ago. 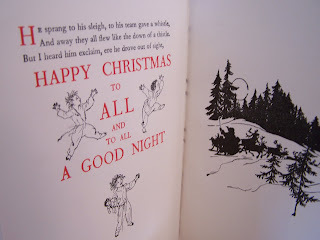 I paid $2 for this copy of 'Twas the Night Before Christmas. It does not have a copyright, but I think it is from about 1940. If anyone knows, I would love informationon it. I have tried to search for it in the past, but not this year. 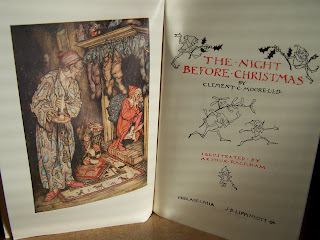 It has six of these gorgeous, intricate pictures or plates as they are called, plus other drawings. 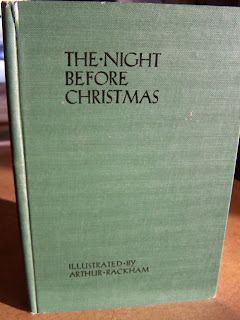 We always read the real Christmas story from the bible on Christmas eve and then we read this. Other things we do to keep the true meaning of Christmas alive is involve our children in giving to others. They each select a child from a tree of giving--these are anonymous kids from our schools and they shop for them. They must work to earn money for the presents. 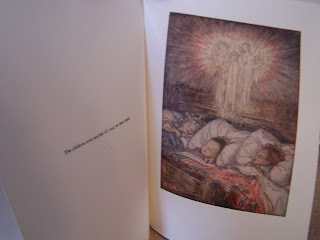 We read a chapter book together during Christmas--something touching and heart warming. We go caroling with the neighbors. 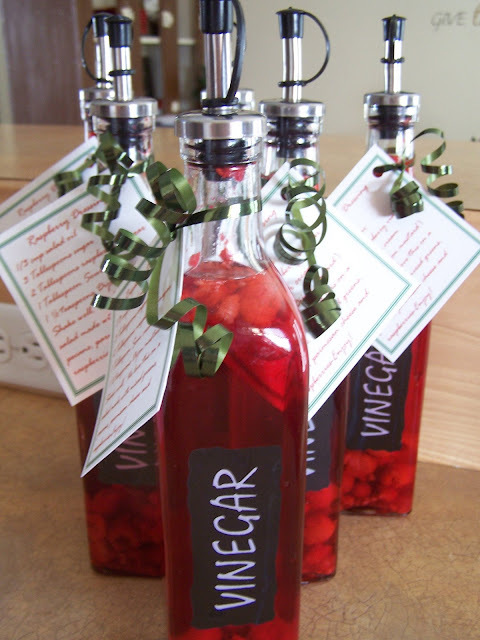 We make sure we hit those "grouchy" neighbors and hopefully soften them up a little. 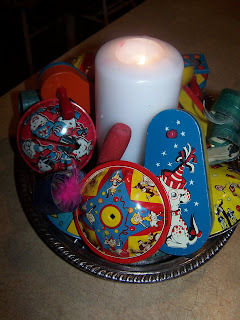 I will share more of our traditions through the coming month. 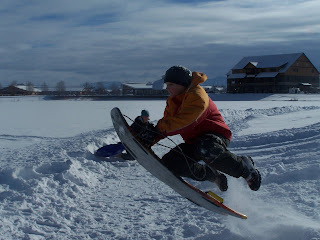 Okay, I bet all you creative ones have been doing this for years, but here in Montana, we are a little slow on the draw sometimes. I have had a cricut for a year. 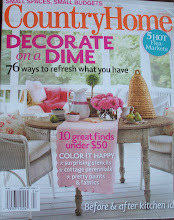 My mama bought it for me, and although I am a scrapbooker wannabe, I am not one at this point and time in my life. I do use the cricut a lot for preschool--it is great. But then I discovered a few weeks ago that they (you know that great "they") made vinyl to cut on your cricut. Now, as I said, maybe some of you have known this, but it was new to me. I have so many project ideas in mind for it. 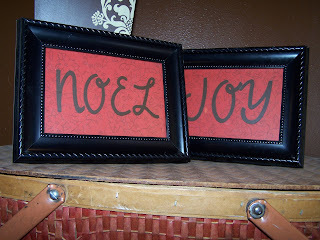 Today I was playing around and made these two little signs with some thrift store frames I had. I used the brown vinyl, and think I would like these better in black. The camera flash changed the color of the scrapbook paper--it is a deeper red. If you don't have a cricut, these could easily be made with scrapbook stickers. Gee, that's three projects in a row with scrapbook paper.